of what Fenton really is. We worked closely with direction from the DDA marketing committee to create a bold statement for Fenton. schools, safe neighborhoods, and a close knit community. It’s close to lakes, everyday shopping needs, freeways and major metropolitan areas. Fenton is a close knit community. Everybody knows everybody. Neighbors care. It’s a place that you can connect. Fenton closeness to the lakes mirrors people’s closeness to each other. Inspiration from close knit, family oriented community led us to research and find the “Fenton” surname coat of arms had four fleur de lis! 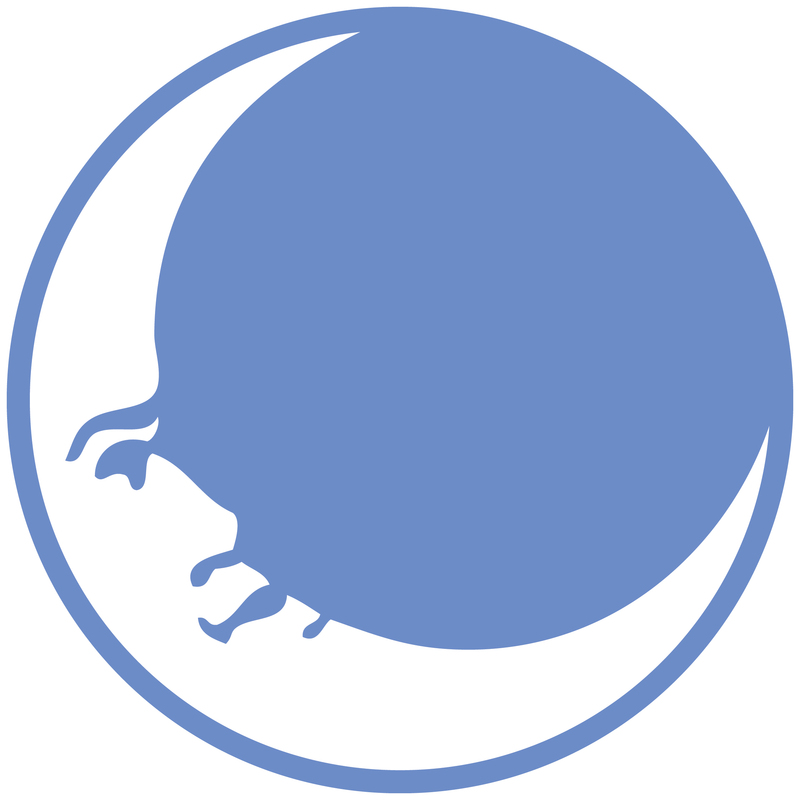 Interestingly enough, the New Moon team was already considering a customized fleur de lis to symbolize rebirth or renaissance representing current developments in Fenton. 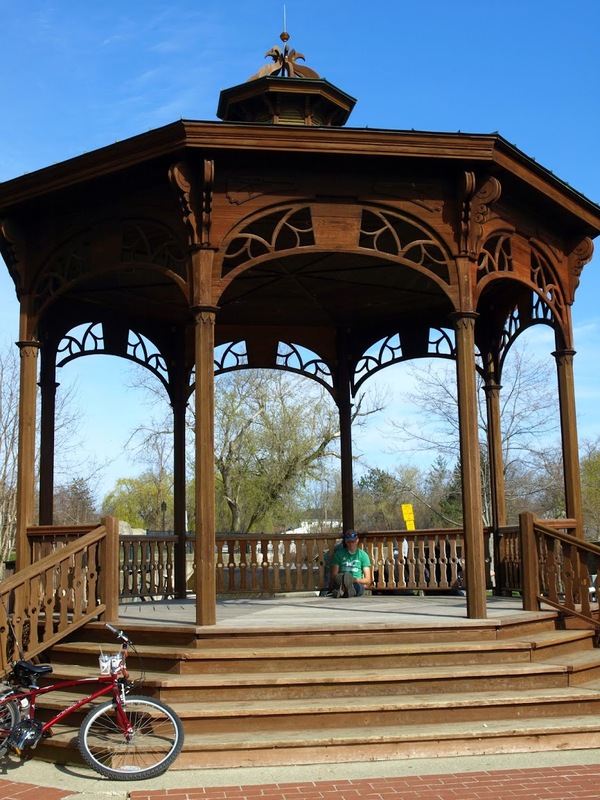 The fleur de lis is also reminiscent of the ornate, crown like finial of the city gazebo, lovingly built by community volunteers. If you look closely, the lilley is made of the letter “f” back to back with a drop symbolizing water at the top and the bottom representative of the Saarinen influence of ‘free form’ (like the tulip chair or the fluted wayfinding signs) We used white, symbolic of purity (Fenton is genuine) and blue and teal colors from nature matching the wayfinding color scheme and symbolic of the lakes. Fenton’s master plan called for more focus and support of the arts. We recommended an Artwalk in the marketing plan to bring that vision to life. The Artwalk was such a great success, that we brought it back as an annual event. The heart of what we do at New Moon is foster relationships. We worked with the Lakes Area Arts Council, LAVA, the DDA, local organizations and the downtown merchants to make it even better every year. The Fenton brand process and campaign was featured in the November 2010 Downtown Promotion Reporter. 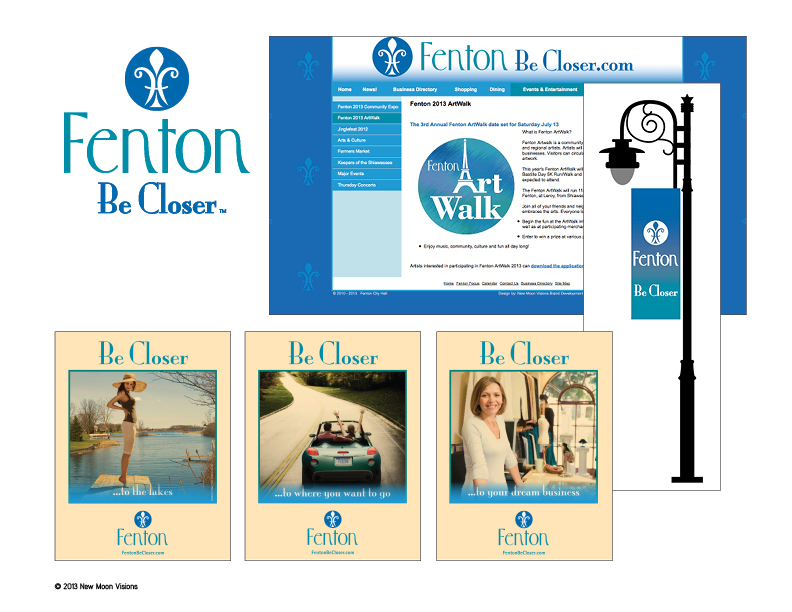 The “Be Closer” theme is carried through their website www.fentonbecloser.com, the Fenton Focus online magazine, communications network, billboards, wayfinding system, streetlight banners, radio spots, event advertising, entertainment guide, print ads, rewards cards, hospitality program, specialty products and business recruitment brochure. The Downtown Development Authority initiatives combined with New Moon’s well-rounded marketing approach and implementation continues to revitalize the district. Some of Michigan’s finest restauranteurs have contacted the DDA regarding the old fire hall project, and thus the renaissance of the city unfolds.